Maybe Warner Bros and Rocksteady were suffering from a sense of nostalgia. Maybe they just don't like PC gamers. 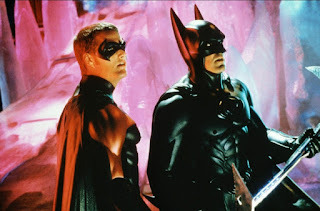 But, for whatever reason, they decided to release a poor port of Arkham Knight on the PC which brought back the horrific memories of George, Arnie and Chris O'Donnell fumbling their way through the catastrophe that was Batman & Robin. That might sound a bit harsh but at least when Batman & Robin came out you didn't have to listen to your friends saying "wow my version of Batman & Robin is awesome, sorry yours is unwatchable dude". Nope, we all just suffered through it together. Holy nightmare Batman, I think they may have screwed up more than we did! Everyone really dropped the ball here, and I would expect companies of their, respective, size to at least carry out a degree of QA testing and realise that the port just wasn't carrying over from the console. Then, after realising just how bad the backlash was, they decided to pull the game from the shelves while they try and fix the glitches and 30fps issues that have plagued it since release. Apparently Warner Bros consider post-release to be the time that you "address these issues to satisfy [y]our quality standards". Perhaps WB should have taken a page out of EA's book after they announced that they would delay the release of Star Wars Battlefront should the game not be ready for all platforms (thankfully this doesn't seem to be the case and all systems are go for the next big Star Wars game). Although EA do have their own history with buggy releases, yes Battlefield 4 we are looking at you! I guess it is pretty easy to paint yourselves as the knight (Ed. as this is a Batman review shouldn't that be Dark Knight) in shining armour when one of your competitors is laying down in the gutter and telling gamers this is as good as it gets. Now I have been fortunate enough to see Arkham Knight on PS4, and it is really good, but it does make me question why a big studio cannot bring that level of quality to all platforms. PC gamers have given studios a good kicking before when PC titles have been delayed while their console siblings hit the shelves, and rightfully so in my opinion. But to release an unfinished should be an an even greater sin that upsetting a few gamers. Sure gamers will be upset with a late release but at least they know they will be getting a good product. But if you are porting your product across from one platform to another you are going to lose some of that quality, and I don't know if that compromise is worth it just to get the game out a bit sooner, I think WB and Rocksteady may agree with this statement now as well. Well so far as letting a third party port their product, if they had ported it themselves then perhaps they could have kept the required level of quality.